We’ve all seen them, the perfectly staged Instagram photos showing your current wine of the moment in front of whatever beautiful background you can find. You do it anyways, so why not win a prize for it? The “Where You Wine” sweepstakes from Whole Foods aims to do just that: give away prizes for those who share photos of themselves enjoying wine around the Pacific Northwest on Instagram with the #whereyouwine and #sweepsentry hashtags! Send a picture, and include the hashtags #whereyouwine and #sweepsentry for an entry. One Entry with the appropriate hashtags is one (1) entry. Limit: one (1) Entry per person, per day, regardless of method of entry. Only entries using the hashtags #whereyouwine and #sweepsentry will be considered valid entries. There will be four (4) random drawings held and each Bi-Weekly winner will receive a $20 Whole Foods Market Gift Card. One (1) Grand Prize winner will be randomly drawn around 08/01/15, from among all eligible entries received throughout the Promotion. Grand Prize winner will receive a Wine Accessory Gift Basket! Since it’s a blast giving away things here at Sips & the City, I’m happy to be giving away a $20 gift card to Whole Foods Market that you can use to stock up on wine to showcase in your #WhereYouWine photos so you can possibly win ANOTHER $20 gift card through the sweepstakes! It’s pretty much the best arrangement ever. To enter, just visit Whole Foods Market's Summer Top 10 Wines page and comment on this post with which of the wines listed you’re most interested in trying. Winner drawn at random on 7/6/15 from all entries received and gift certificate will be sent electronically, GOOD LUCK! Did you hear about the party on the Pier? (see what I did there? I’m a poet and I didn’t even know it..) Wine Rocks, a Tasting Event is back in action on Thursday, July 9th down at Pier 66 on the beautiful Seattle waterfront. This awesome venue has been home of this event for the past few years and offers great views and a perfect space for this ever growing event. I love Wine Rocks because it’s an opportunity for winemakers to showcase their other creative side: music! All but one of the musical acts performing at this year’s event is affiliated in some way with a Washington winery! This year's event includes a 5 p.m. early VIP entry ($50/ticket) limited to just 50 people (with the general admission ($35/ticket) starting at 6 p.m.). If you're tired of bumping elbows with other people while trying to get your next taste then try out this option! Also, all advance ticket purchasers (VIP or GA) get a ticket for Wild Salmon Sliders and other snacks from Ray's Boathouse! Like what you're tasting? There will be a wine store onsite so you can take home your favorites! I attended this event last year and really liked the small intimate nature of it. Sure, the big wine tasting events are fun and offer a huge variety, but the small events give you a chance to learn a little bit more about the wines you're tasting. Less people means a better chance to talk to the winemakers. The view doesn't hurt either, who doesn't like sipping wine while staring out at Puget Sound? 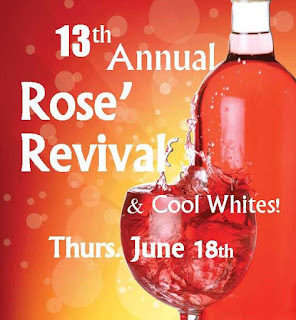 So let's hope for a beautiful night like we had last year and get your tickets now for this year's Rosé Revival & Other Cool Whites on June 18th!